Approaching death in a Turkish-American relationship: Is it time to stir the irmik helvası? Surrounded by the puppets and M. on the crinkle-comfort white couch, I listened to the filtered sound of traffic in the windy streets of Nişantaşı coming in through the slanted, modern windows that opened towards me, as opposed to just the usual up. It was a new version of “crack open the window a bit” as far as this old-fashioned house design girl was concerned. Having received the news that my father would be moved to hospice, and that I should consider coming home, the swirls of thoughts rendered my mind as unclear as a demagnetizezd radar instrument. Part of my brain recognized G.’s slow motion voice about where to change the Turkish airlines ticket, but the cacophony of the puppets peppered questions got in the way. Kenne, Queen of Manners and Ladylike Behavior took the lead, shepherdessing the cengi dancing ladies as well as a reluctant to leave her mirror Safiye Rakkase (the vainglorious dancing girl) and the like into a triangle behind her. “M’lady,” she intoned with great seriousness and caring, but also a wee dram of pomposity, “is it time to begin stirring the irmik helvası? 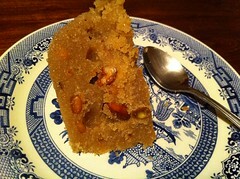 Or is there a different tradition you wish us to learn?” I should add here as a side note, that Irmik helvası is a rich semolina dessert that while readily available – is also traditionally served after a funeral, when the Imams pray at the home of the bereaved. Before I could consider how to answer Kenne, Perihan Hanim, my fairy godmother puppet, swung down from on high to whisper in her ear that it was too early for irmik helvası – explaining that hospice is a place where people go at the end of life, to bring some dignity to the dying process and to bring supports for the family into place. Red-faced and teary at the thought of suggesting irmik helvası before someone had passed away, Kenne slunk away in disgust with herself, having failed her role as a traditional lady in search of maintained honor. I heard her in the bedroom, pulling down her puppet-sized laptop, as she commenced thrashing the keyboard to produce another new chapter on cross-cultural etiquette in non-Ottoman eras. I am sure it will be a best-seller. Hacivad Bey (the learned sufi elder) and Yehuda Rebbe, (a Jewish wise man puppet) those senior statesman, nodded their approval at this utterance while Mercan Bey, the spice trader from the Arabian peninsula snuck out to the Mısır Çarşısı for a last load-up of pul biber and baharat before the long flight home to Boston. Esma the hippie puppet just began to massage my always-aching feet with rose of Damascus oil as Tiryaki Bey, the opium addict, blew smoke in my face to hasten some sleep before the hard days to come. It was the only way he knew how to help. And as my mind pixellated in grainy chunks like so many slow-Internet connection bits, I recognized the rose scent mixed with Tiryaki’s pipe smoke wafts, I let the reality sink in. This was “it,” my Dad was going to die soon. We were heading home to the United States to spend time with Dad in his last days. This entry was posted in Family Challenges, Turkish Food!, Visits from the Karagöz puppets and tagged cooking, Damascus, death, end-of-life, islam, Moon, Nişantaşı, Puppet, Puppeteer, Turkish Airlines, United States, yavash yavash. Bookmark the permalink. 17 Responses to Approaching death in a Turkish-American relationship: Is it time to stir the irmik helvası? I’m so sorry to hear about your father. Both Liam and I hope his passing is peaceful. . . the confusion of realisation! J and I talk about the ‘end of life’ (not a lot, but enough) and how we will cope/deal with it, living, as we do, in the midst of a much loved but foreign village culture. That our kaymakam son’s father and mother, in the midst of their own grief for the loss of ‘Granny’, felt able to reassure us that they would take care of us when our time came was a moment of profound cross-cultural connection. Love and respect, charity in its broadest meaning, are the greatest of virtues. So sorry to hear about your father. My thoughts are with you in this difficult time. Thank you so much, Madhu. I apreeciate your kind thoughts! It will be good, however, to get back into the land of blogging, and I look forward to catching up on yours! So sorry to hear of your father’s passing. Lovely post.